Accusing Kejriwal of taking a “U-turn”, the 48-year-old Gandhi tweeted that the Congress is still willing to give 4 seats of the 7 Lok Sabha seats in Delhi to the AAP. 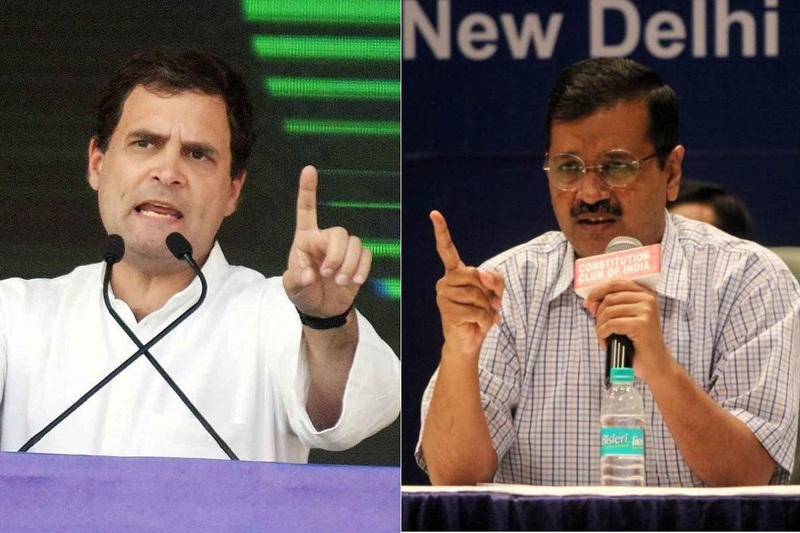 Congress president Rahul Gandhi got involved in a blame game on Monday with Aam Aadmi Party (AAP) chief Arvind Kejriwal over the formation of an alliance between the two parties to take on the BJP in the ongoing Lok Sabha elections. “An alliance between the Congress & AAP in Delhi would mean the rout of the BJP. The Congress is willing to give up 4 Delhi seats to the AAP to ensure this,” he said in the tweet. “But, Mr Kejriwal has done yet another U turn! Our doors are still open, but the clock is running out,” tweeted Gandhi adding the hashtag “#AbAAPkiBaari” indicating that he was putting the ball in the AAP’s court. Responding to his tweet, Kejriwal, the Chief Minister of Delhi, shot back accusing Gandhi of not showing an intention of forming an alliance and dividing the anti-Modi votes in UP and other states. “What U-turn? The talks were on. Your tweet shows that you are not interested in the gathbandhan (alliance). I am disappointed that you are issuing statements in this manner. Today saving the nation from Modi-Shah is of prime importance. The tragedy is that you are creating a divide in the anti-Modi votes in UP and other states thereby helping Modi-ji,” tweeted Kejriwal. Kejriwal was backed by AAP leaders such as Sanjay Singh and Gopal Rai who questioned Gandhi on why the Congress was not agreeing to a pact with the AAP in Punjab, Haryana and Chandigarh. The Twitter exchange came amid reports that the two parties are likely to hold talks for a tie-up on Wednesday. The AAP has been trying to form an alliance with the Congress since before the start of the Lok Sabha elections. The AAP is reportedly trying to push for 5 seats for itself in Delhi and 2 to Congress. It is also seeking an alliance in Haryana and Chandigarh but Congress is asserting that the pact should be for Delhi alone. On 14 April, Kejriwal again stated that he is open to weave an alliance with the Congress for the Lok Sabha elections to ensure the BJP’s defeat. But Kapil Sibal and Abhishek Manu Singhvi, the Congress leaders who were also at the press conference, remained non-committal. The Wednesday meeting between AAP and Congress would reportedly involve senior Congress leader Ahmed Patel, AAP leader Sanjay Singh, and NCP chief Sharad Pawar in the role of a “mediator”. While the Congress is yet to name any candidate in the national capital, AAP has already announced its candidates for all seven seats. The BJP currently holds all 7 seats in Delhi, where elections are scheduled in the sixth phase of the Lok Sabha polls on 12 May.